From the Shortcuts form, click Find People (or click from the main tool bar). Type a unique part of the person's information in one or more of the available fields, Name, Address, Phone, Email, or Partner field. Click Find to display the results, double click on the desired contact, to view their profile. From the Customer, Unit or Address List tool bar, click and type part of the contact's name. As you start typing the first or last name of the contact, the list will drill down to only include the possible contacts. Double click on the desired contact to view their profile. Did the contact get accidentally deleted? If so, check Boulevard's Recycle Bin (See Restore Contact from the Recycle Bin). Are there column header or sidebar quick filters set? 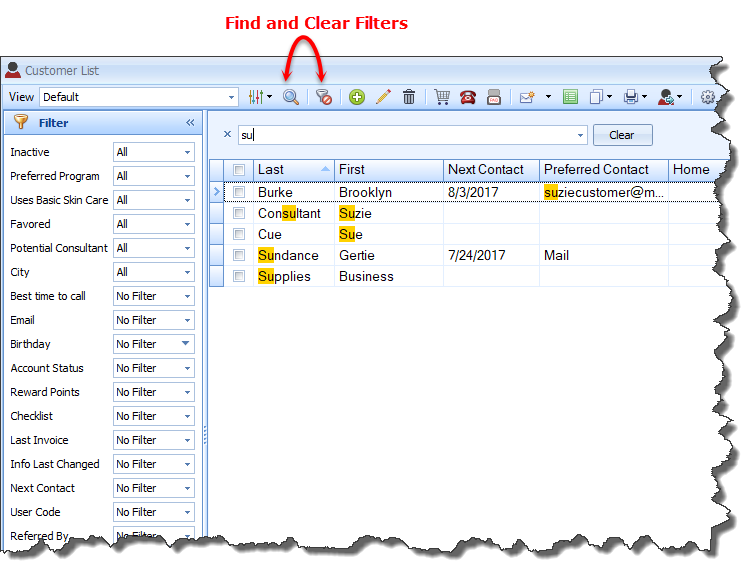 From the toolbar of the form you are working with, click the to clear any filters set. Did the contact get marked inactive? If so, see Mark Contact Inactive and Additional Options.